Today I tried something new. YouTube features some full length F1 races from the past, which, given my interest in reliving F1 history, I've taken an interest in watching. Today I watched one of these classic F1 races in full and posted Twitter updates on it as live (under the hashtag #retrof1). The race was the 1995 Canadian GP. If you want to watch along with the full race the link is here. And the #retrof1 twitter timeline can be viewed here. An edited timeline of my tweets is below. This may become a regular feature with other races available in full online. Though if it turns out that I achieve little beyond annoying people by clogging up their Twitter feeds then I'll abandon the idea. The unmistakable tones of Bob Varsha kick us off. It's ESPN's coverage, and it's been raining in Canada. Oh my god, James Allen was ESPN's pit reporter in 1995. Didn't realise he had experience when picked up by ITV in 1997 to perform the same role for the UK coverage. @MKaipio So funny to see @DerekDaly500 and @Jamesallenonf1 there! Nice to think they're still going strong in F1 16 years later! To set the scene, this is the sixth race of the 1995 season. Up until this point this season was a Schumi v Hill battle for the title, though Ferrari were sneaking back into contention after their early '90s period in the doldrums. And they're off - a green light still used in those days. They're in grid order at the front on the first lap. Track still has plenty of damp on it. 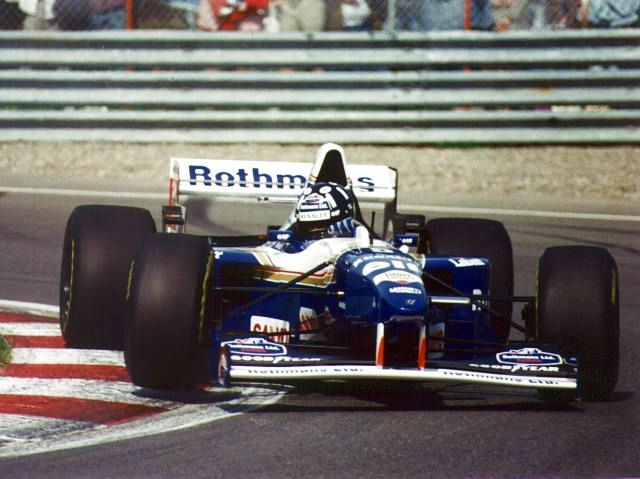 Mika Hakkinen with an ill advised lunge on Johnny Herbert's Benetton, neither now going anywhere soon. It's all happening. On lap two David Coulthard spins off on a damp patch under a bridge and is out. Ferraris had to brake hard in response. DC with a face like a smacked bottom right now. @NeilBaileyF1 I love the way you're giving us live updates on a grand prix that took place 16 years ago! LOL! Turns out Alesi managed to sneak ahead of Berger when they were avoiding Coulthard. Alesi now P3 behind Schumi/Hill. The Montreal track is a different animal in those days compared with now, there was no long straight before the final chicane. Instead there's a (very) makeshift chicane marked out by cones(!) slowing cars down before a right-left-right sequence which has walls close. Schumi's running away at the front with it by a second a lap, Hill in P2 beginning to be harassed by the Ferraris. Mika Salo gets a 10 second stop-go penalty for jumping the start. I remember there were lots of these penalties handed out in 1995 for jumping the start, it was the first year they had an electronic gizmo to catch offenders rather than just relying on people spotting it. It also took drivers a while to work out creeping wasn't allowed! @LauraLeslie23 6 drivers got a jump start pen in Monaco 95. Yes, it took the drivers a while to twig that they had to stay absolutely still on the line, didn't it? Mika Salo in again, as he didn't serve his full 10 seconds penalty first time around! Bet that put him in a mood. I have to say, the V12 engine in that 1995 Ferrari sounds wonderful. Unless I'm very much mistaken, the 1995 Ferrari was the last V12 engine ever in F1. A pity in terms of acoustics. @LauraLeslie23 Nope you're right. Ferrari introduced a highly unreliable V10 for 96. Bit of a sad day when Ferrari abandoned the V12, though it worked out OK for them in the end! @mario_eb F1 must let teams to design engines with the number of cylinders they want or need. That way we'd have different sounds. It would be nice to have a mix of engine sounds, but it's all about saving money and doing what car industry want these days. @mario_eb A real shame. #F1 (what is left) needs a little of diversity, it can't be so standard, that fact makes it so boring I guess. F1 has always been about diversity in past, pity we seem to be losing that these days given desire to control costs. Jean Alesi squeezes down inside of Hill at the hairpin to take P2, and we missed it because we were on an ad break! It seems in 1995 the whole 'backmarkers paying attention to blue flags' things was not as rigourously enforced as now. Pierluigi Martini in his Minardi holds up Berger for a lap when being lapped, Derek Daly says he's 'either blind or stupid or both'. Twenty laps in: Schumi leading Alesi by 11 seconds, who is 3 seconds up on Hill. I have to say the 1995 Ferrari is one of the most beautiful F1 cars I've ever seen. I think part of it is the lack of a high nose, I'd ban high noses on aesthetic grounds. @adamredman5 Agree. Bring back low noses and V12's! And those fat boy tyres! Agree, if I was in charge of F1 I think those are the first things I'd do! Martini gets a 10 second stop-go penalty for blocking Berger. Drive-throughs not part of the stewards' weaponry then. Berger now passes Hill for P3, at a very unlikely point of the track! Hill off song today it seems. Martini's not learned his lesson, he's getting in Schumi's way now. The Jordans are running P5 and P6, with Rubens Barrichello ahead of Eddie Irvine. Daly comments that Rubinho is talented but short of confidence. Amazing how without the long straight the Montrael layout is a bit like Monaco or Hungaroring, rather than the quick circuit it is today. Eddie Irvine makes a scheduled pit stop, looks like one stop strategies all round. We're 34 laps into a 69 lap race, so about half distance. Alesi in, his stop is a very long 16.7 secs, it seems like an age! It seems to be the going rate for a stop though. Hill and Rubinho also in. Berger crawling into pits. Daly thinks he's run out of fuel. I happen to know with wonderful hindsight that he's right. Berger just makes it in, but loses a shed load of time. The Montreal track requires a lot of fuel, the Ferrari V12 engine is very thirsty and the fuel tanks then were mostly not as big as they were to become (the designers made them a bit bigger in future years to allow more flexibility on strategy). A combination of these things caught Ferrari and Berger out. Schumi meantime goes on and on at the front, he hasn't stopped and is 52 seconds ahead of P2! He's lapping 1 sec a lap quicker than Alesi on his light fuel load, he seemed to do this every race in that 94-95 period. Schumi now pits, his stop was 4 seconds quicker than Alesi's. How did they do that? Varsha points out talk in the race programme of a 1996 US GP in Las Vegas, incorporating the Strip as the start/finish straight. That didn't work out. It's easy to be wise with 20/20 vision of hindsight of course. But in F1 always been a big gap between talk and reality. Berger now down in P8 after his fuel absence delay, behind none other than Martin Brundle (yes, him). Somehow, over the pit stop phase Schumi managed to increase his lead over Alesi from just over 10 seconds to 28 seconds. In these early days of refuelling, Benetton were on a different plain to everyone else on pit strategies. Taki Inoue - a man famous for being run over by a medical car (no word of a lie) - is lapped. @ElenaF1 Poor guy, what was of him after his F1 career? No idea what became of Taki Inoue, he is on Twitter, maybe you should ask him! He tends to tweet in Japanese though :) He didn't have the best of luck, he was also pitched over by a course car in Monaco that year as well! @ElenaF1 Wiki: After a brief switch to sportscars he retired from racing at the end of 1999 and now manages drivers in his own country. Mark Blundell's McLaren breaks down, looks like a Mercedes engine failure. F1 car reliability then nothing like it is now. But 16 years on, McLaren and Mercedes are still in a partnership, and have had a lot of good times together! James Allen says Williams just too slow, there are no specific problems. As soon as he says that Hill park. It looks like technical failure for Hill. Berger's Ferrari right behind Brundle's Ligier, seems to be getting nowhere near him on the straights though. Looking good for Schumi - on for 10 points with 0 for Hill. It would increase his championship lead to 15. Brundle flashed past Schumi on his rear view camera - oh lordy! 'Where is Jean Alesi' shouts Derek Daly! The crowd goes wild - amazing scenes like they're trying to tell Alesi about Schumi's problem! Schumi coasts into pits. There are 11 laps to go and Alesi flashes into the lead! He's never won a race before, and it's his birthday! It's not a quick fix for Schumi, but after a steering wheel change and a reboot he's back going, but way back in P7. The Jordans are up to P2 and P3 with Barrichello ahead: 'what a pint of Guinness that would be for Eddie Jordan' says Derek Daly. Berger savages Brundle at first corner, both are out. 'A kamikaze move that he had no hope of pulling off' says Daly. This means Schumi's up to P5 and back in the points (only the top six got points then, remember). My word David Coulthard looked young in 1995. Ferrari number 27 leading at the Circuit Gilles Villeneuve - this sport can be wonderful sometimes. Even 16 years on - these final laps seems to be taking forever! 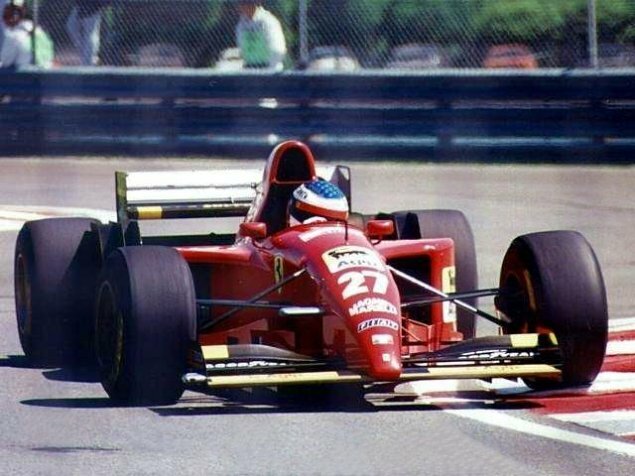 Alesi's hopes have been dashed before after all! Schumi's pelting around after Panis looking for an extra point. Jean Alesi starts his last lap, the crowd noise can be heard above the engines. 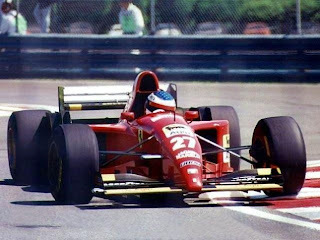 Alesi later said he could barely see final corners because of tears in his eyes. Jean Alesi takes the win - not a dry eye in the house. The crowd has broken ranks already, the start-finish line is crowded with spectators and many cars have not yet finished. Looks a bit dangerous. Derek Daly says this will be the first of many GP wins for Alesi, sadly that proved not to be the case. Alesi's rotten luck that characterised his career was to continue. And Alesi was nearly deprived of this win, he ran out of fuel on the slowing down lap! So close to heartbreak again! The race result was given after 68 (not 69) laps, as Salo was passed by Badoer on the last lap because track was crowded with fans. @ElenaF1 Anyway, Alesi was worthy of winning the race, good driving and good luck too. Yes, watching the race again reminds me it was one of those races that brought a smile to everyone's face. I'm sure even Schumi fans wouldn't begrudge Jean this one! Ah! yes the 1995 Ferrari - if not the most beautiful Ferrari of recent years? (or many years before that too) The shape is simply awe inspiring & the sound of it is simply wonderful (the last V12 F1 Ferrari?) I was at the 1995 British GP with Berger & Alesi flying round (& was reminded of the fine sound at a Donington event a few years ago). Not a great year for results but my favourite F1 Ferari.